Midnyte Reader: Guest post by Erika Henrike - Michael Montoure and the Many Horror Shorts. Guest post by Erika Henrike - Michael Montoure and the Many Horror Shorts. I’ve been reading horror books for years now, although most of them tend to be from the years back, like HP Lovecraft and Clive Barker. 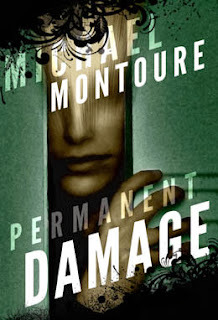 For me, I just haven’t really found as many horror writers of the last decade to really capture me with their books, until I came across Michael Montoure and his collection of short stories. Michael Montoure is probably not an author you’ve heard of too. That’s because he’s pretty much been exclusively publishing short stories, and those aren’t always the easiest thing to actually have an agent or publishing company pick up. Quite honestly, I’ve always found that short stories are where horror pieces are really able to shine. It’s like the perfect area for the genre, since a fully developed novel is never necessary to truly freak someone out or make them just have to keep the light on when they go to sleep. His two major collections of short stories currently are Slices and Permanent Damage, both of which manage to offer an assortment of types of horror. There’s some psychological horror pieces like the short story ‘The Leak’ which introduces elements similar to the Tell-tale Heart, but with blood dripping from the floor above in an apartment. And then there are also some monster story type horror elements, like “Melt the Bullet, Blunt the Knife” which involved a type of were-wolf through the shapeshifting element of using a belt made from wolf furs. Regardless of which kind of stories you might like the best, there’s always at least one kind of story you like in each of his one-man-anthologies. Of course there are stories in there that also capture your sense of dark humor or amusement too. And what I mean by this is one of the stories starts of in a similar light to what you would expect from one of the recent vampire romance novels. A girl named Nikki keeps wanting to find a vampire in the world so she could be immortal and enjoy herself forever, and maybe even find that hunky vampire out there for her. But as the story goes on, this whole time she’s being slowly lured in by this charming guy masquerading as a vampire, and then finally she realizes who the real vampire is. She realizes that vampires aren’t these pretty and amazing creatures, they are sad, lonely things that rely on others to give them the blood they need. It was such an amazing twist in a story I initially wasn’t interested in reading, and I think because of the way it starts not everyone gives it a chance, but it is incredibly absorbing and interesting. And that is just one of the many short stories this author is constantly producing. He also has a massive collection of short stories he brings back too like the anthology Counting from Ten, which is actually a bunch of stories he did well before the other two books but was released later on (as far as I’ve seen). And I know, I call him a horror writer, but not all of his work is totally horror-esque. He’s called himself a Dark Urban Fantasy writer too, but regardless all of his stuff has dark themes to them that pull from areas between the unknown and known, like a story on the faerie circles, or heck a frightening one about imaginary friends. But despite the fact that he’s neither a totally well-known horror author or one that is ‘traditionally published’ he’s still become one of my favorite more recent horror authors and I just love being able to share what I can about his writing so hopefully others can enjoy it too! About the Author: Erika Henrike is a sewing professional who loves talking about fashion, horror, and pretty much anything awkward and creepy-crawly. She is fond of the more odd and unusual knick knacks in the world and likes writing about them to share her interest with others. In her spare time she likes creating taxidermy dioramas and decorating her own purses.